The VW Caddy is the best-selling MPV in Germany. Here you see a latest Caddy4 as a passenger car with 5 seats. 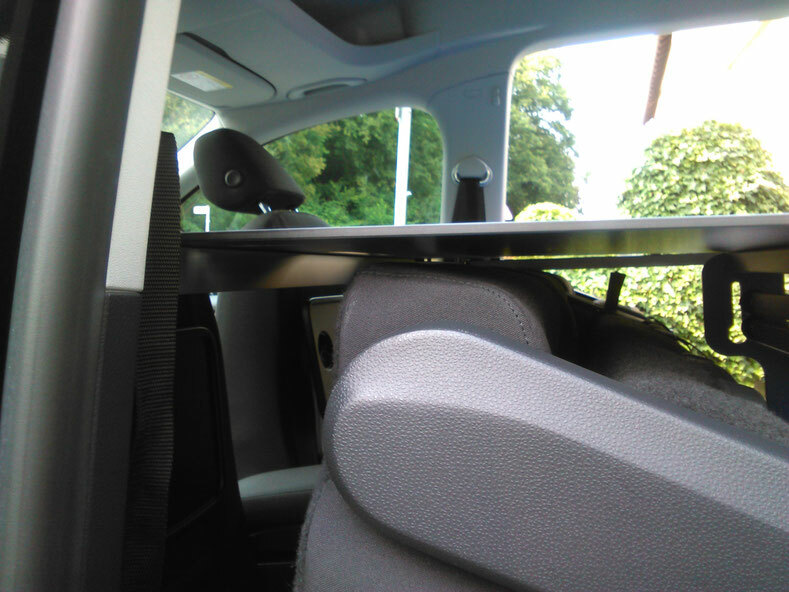 + The rear passenger seats might stay in the car when it is folded to the front and the height of the camping unit is appropriate adjusted. - This model has no 12V-plug in the rear. - The backrest of the right passenger seat can not be folded to the front in this model. The car boot cover has to be removed. The second row might stay in the car. It has to be folded to the front. 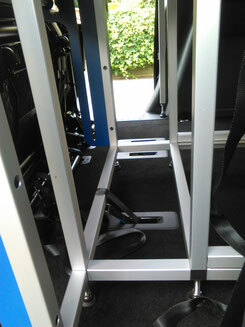 While using the adjustable feet the lying surface can be adapted, that it is built over the back seats. 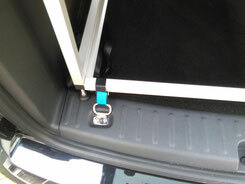 As you can see in the pictures it was mounted like this and the carpet did not get any damages. The unit was just for a weekend in use. 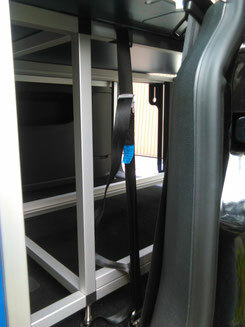 It is working without the adjustable feet too, but then you have to remove the rear passenger seats. Here the adjustable feet are arranged so that the front lying surfaces are supported by the folded rear passenger seats. So you do not even need the straps to fix these panels. 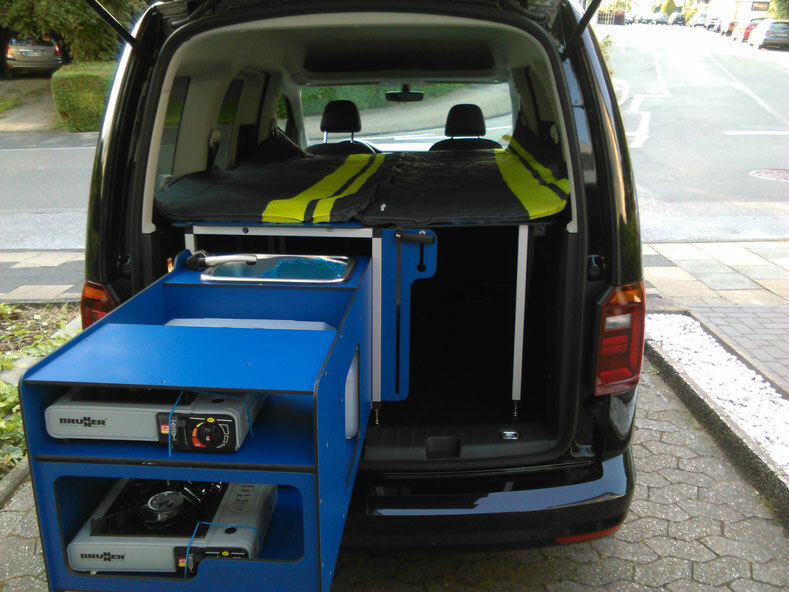 Because in this model the backrest of the right passenge seat is not completely foldable, you can not load so much gear as shown in the Berlingo. If you move the right rear passenger seat you might load some stuff. There are no pictures with a bycycle but it should work too. 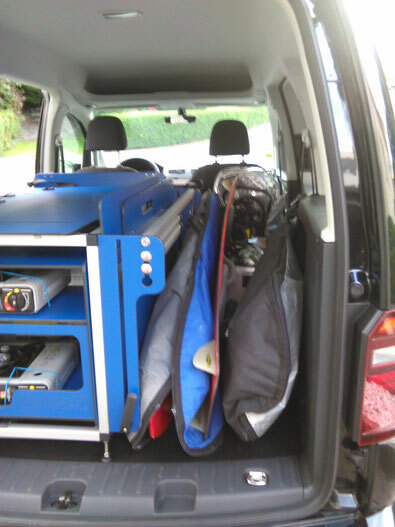 Here you see a complete set of wavesails (5 sails 3,6 to 5,7 m²), a 100l-board, 2 booms, 3 masts. Right mirror still good visible. Singlebed and kitchenbox usable. Left rear passenger seats are still mounted. 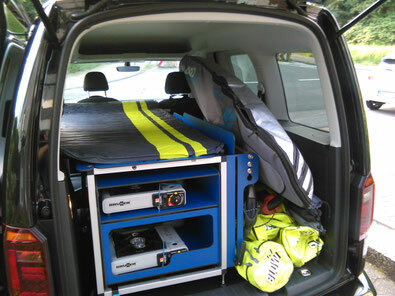 Here you see a little bit of kiteboarding gear (2 waveboards, 1 twintip, 3 kites, 7/10/12 with bars and pump). If it is packed better, the double bed should be usable, single bed for sure and kitchenbox too.